Keeps frequently used text and images readily available. Developer website: Houdah Software s.à r.l. Is there a better alternative to SnipEdges? Is SnipEdges really the best app in Word Processing category? Will SnipEdges work good on macOS 10.13.4? 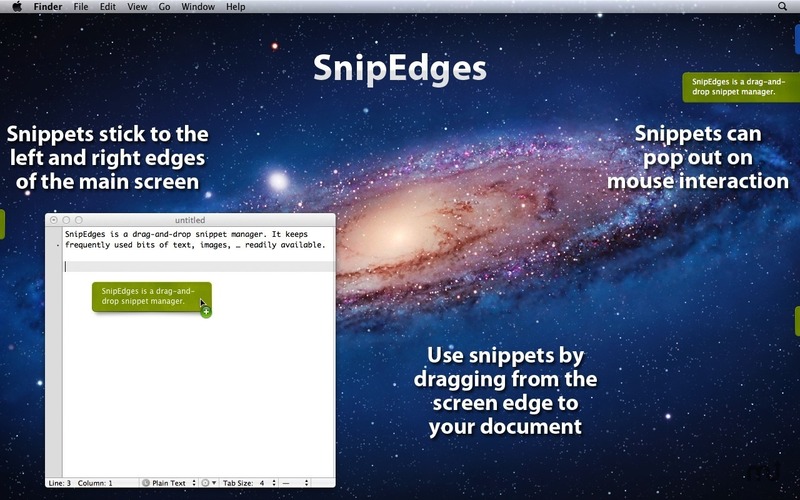 SnipEdges is a drag-and-drop snippet manager. It keeps frequently used bits of text and images readily available. Uses include: your signature, letterhead, commonly used phrases, … Snippets also work as file / folder templates. Create "empty" documents by dragging a file snippet to the Finder. Create folder hierarchies by dragging a folder snippet to the Finder. Snippets stick to the edges of your screen. Create a snippet by dragging text, images, … to the left or right edges of you main screen. Use a snippet by dragging it to its target destination. SnipEdges needs a review. Be the first to review this app and get the discussion started! SnipEdges needs a rating. Be the first to rate this app and get the discussion started! Is easy: drag-and-drop some text, an image, a file, … anything to the border of your main screen. SnipEdges will hold on to it in a snippet stuck to the edge of the screen. To use a snippet, grab it and drag it to where you need it. This also works for folder structures. You may want to set up a specific folder structure for each of your clients, projects, … E.g. a subfolder for invoices, one for letters, one for meeting notes, … Just create the folder structure once and add it to SnipEdges. Now you can create a new instance of the the folder structure by just dragging the snippet to the Finder. Caveat: Snippet only store references to files and folders. The original files must not be moved or deleted. Otherwise the snippet goes stale.